The magic of manty in Arslanbob | Where to next? 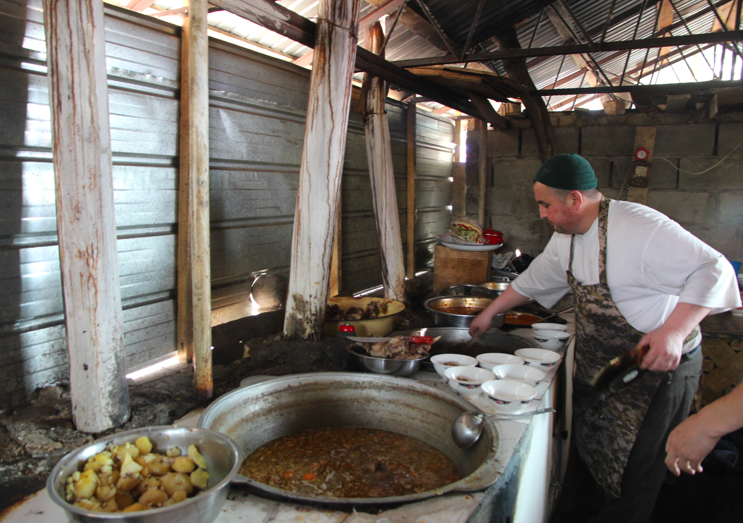 Near the end of our walk in the hills behind Arslanbob, we asked our guide, Abdullah, where to have lunch in town. We don’t mean the tourist places. We want to go where you eat. I’ll take you there. And he did. The restaurant, with a name I’ll never know, was tucked around a corner behind the bazaar. We filed past the kitchen and up some stairs. The dining area was filled with those day-bed structures that are common throughout Central Asia and big enough for a group. So 10 of us piled in, leaving Abdullah at the ‘head’ of the table. He dashed downstairs, grabbed a menu, explained our options and took our orders. First came green tea for everyone. It’s the staple drink in much of Central Asia. Russians drink black tea, but the Uzbeks and Kyrgyz drink green, so we follow their custom. Then came the soup, plov (rice with meat and vegetables), manty (meat-stuffed steamed dumplings) and other main dishes. Poor John and I shared and we had to agree that these were the best manty we’d ever eaten—doused in an exceptional tomato sauce—and the second best plov. The first best was in 2011 in Tashkent, Uzbekistan, but that’s another story. Everyone loved their choices and it was great fun to people-watch as hungry diners came and went. 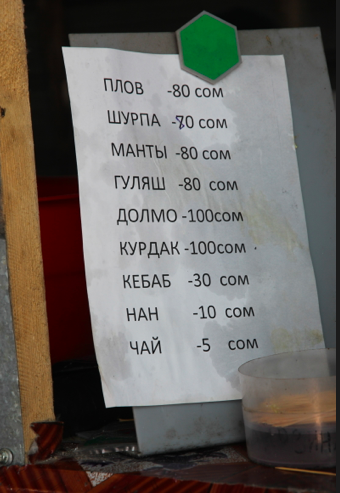 If you take a look at the menu, the dearest items were the dolmo and kyrdak (fifth and sixth items on the list) at $2 each. The last two items are bread (nan) and tea (chai) at 20 and 10 cents each, respectively. Always interested in the source of the food, I asked permission to visit the kitchen. It’s a basic affair, with cauldrons of soups and sauces, and a no-nonsense chef who loves his job. If I come across manty and plov recipes half as good as his, I promise to post them here. And if you’re a food lover, be sure to check out my cooking blog. I definitely want a recipe for manty. And how different is it to Chinese dumplings? You’ve got me there, suchled. Not sure how different they are, but I’ll work on an answer when I get home next month. Plov is rice with a bit of meat and vegetables (mostly carrot) and manty are steamed dumplings. Peggy is right, Plov is rice with small pieces of meat (lamb), vegetables including slivers of carrots…Manti is a dumpling often with a spicy lamb or beef mixture inside, steamed/boiled and served with some topping. There are many kinds of Manti, the Turkish Manti is topped with yogurt, garlic and sumac. And Chinese dumplings often use pork and vegetables mixture, topped with a spicy soy hot sauce. Thanks Sy for your excellent explanations. 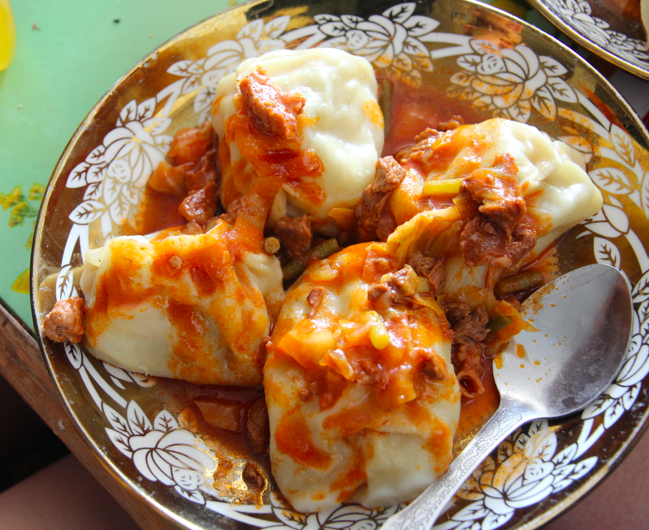 Sometimes manty in Kyrgyzstan gets served with yogurt, which Poor John and I especially love. As always you and Poor John find the best local places to eat. The manty looks delicious! Thanks Louise, I’ll have to have a go at making manty when I get home. Delish! Here is a comment 3 1/2 years later when recently LeggyPeggy mentioned Manty dumplings. So I decided to Google for a good Manty/Manti recipe and made them. For one variation I used Chinese wonton skins and with a Yogurt Sauce. For the second variation I also use Chinese wonton skins and with a Butter/Garlic Sauce. And the third variation was making my own home made dough and topped with a Tomato Sauce. For all three variations I used beef as a filling (lamb would have been better). The dumplings were steamed using my bamboo steamer… which produced a slightly overcooked filling. And I do not know how to make a thin dough, so the third variation was to doughy so-to-speak. The next day I re-heated the dumplings in a microwave and they were excellent… soft, a moist filling and simply great with the Yogurt Sauce! Plus I had put into a zip lock freezer bag some extra dumplings I did not cook and will make them the next time by boiling in water. Thanks PegZ for directing me to this blog post and the Manty dumplings… and again as you said the dumplings with the Yogurt Sauce (and fresh chopped mint leaves) really made for a tasty dish. Oh Sy, I’m so pleased to know the dumplings and yogurt sauce were a success. Hope the frozen ones turned out well too. I’ve found a couple of manty recipes that I’ll try one of these days.